Vicky Harding & Claire Moore assisting Cobb Creek. It is hard to find good help. Ft Frederick, April 2014. 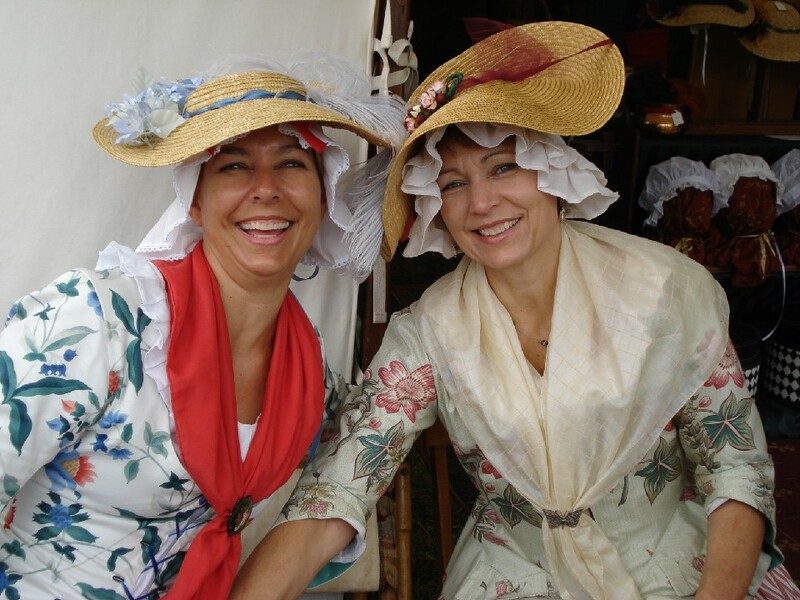 Cobb Creek has a wide variety of head covering styles for the ladies of the 18th century. What would you like? Ft Frederick, April 2014. 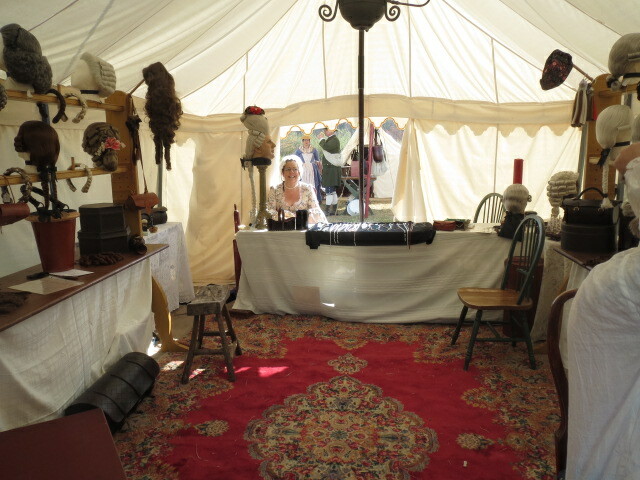 This is Betty Meyers' "Wigmaker of Williamsburg" store. Wow, what a place to shop. 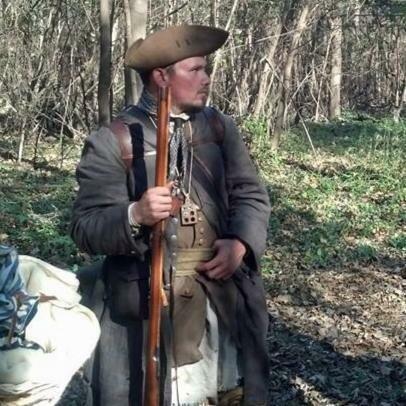 It's quite a leap in apparel and persona for many reenactors. Ft Frederick, April 2014. 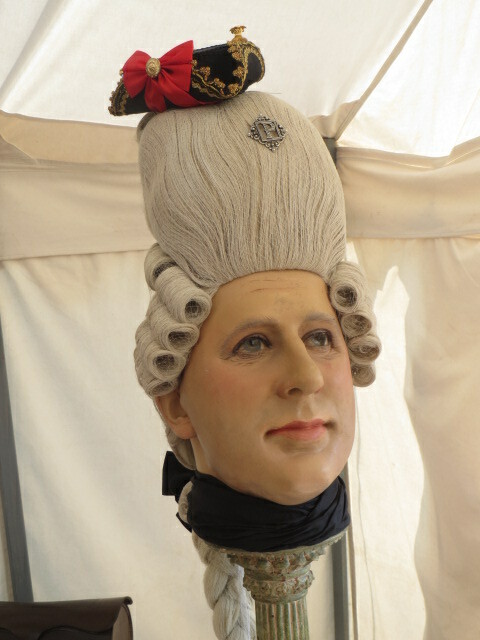 Here are some selections of the "Wigmaker of Williamsburg" store. Enjoy. Ft Frederick, April 2014. 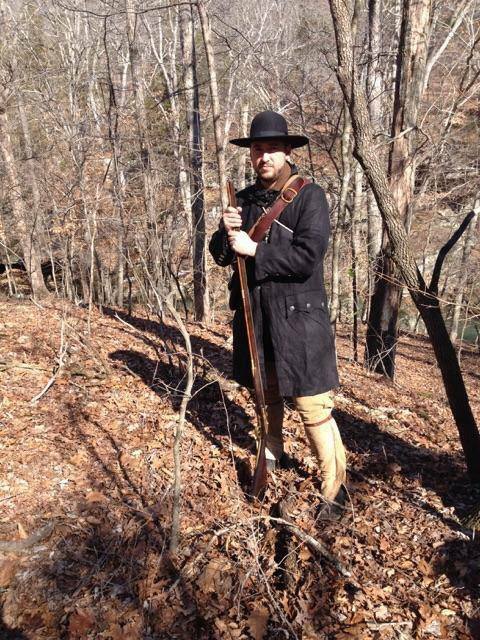 This is not a reenactor. Look closer. 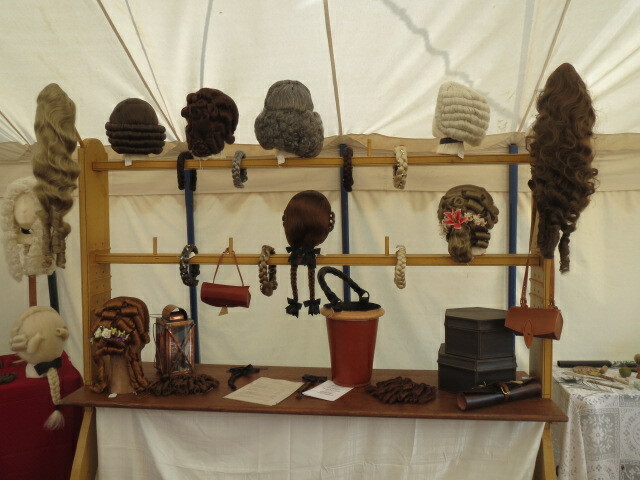 It's an impressive display from the "Wigmaker of Williamsburg", and I love it. However, my Web Master keeps suggesting captions for it. I keep rolling my eyes every time he tells me one, confirming he's just another mid-western redneck. So, over to you my dear reader. What would you like this introduction to say? Ft Frederick, April 2014. The Mike Schubert family - Mike, Wade and Claire. Mike was an exceptionally good friend of Larry Ring and continues to be one of mine. He feels close again to Larry each time he visits Cobb Creek at Ft Fred. Their son Wade was 4 years old when we met. I think he is around 20, now. 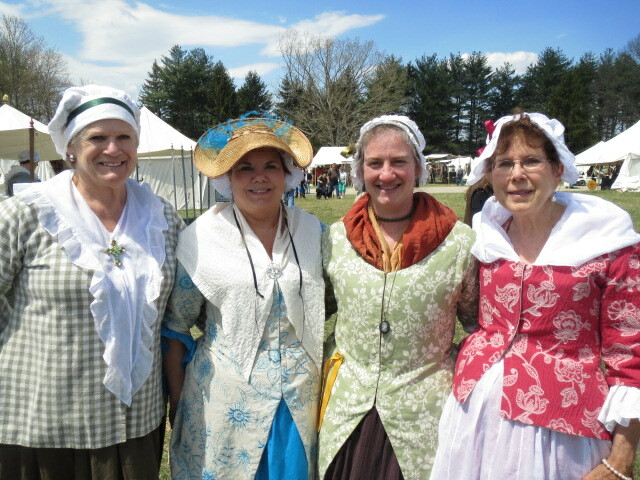 Vicky Harding, Kathy Ring (me), Claire Moore, and Karen Krill posing at Ft Fred for our annual picture. Ft Frederick, April 2014. Ladies shopping Cobb Creek. Thank you Ladies! Come again. Ft Frederick, April 2014. 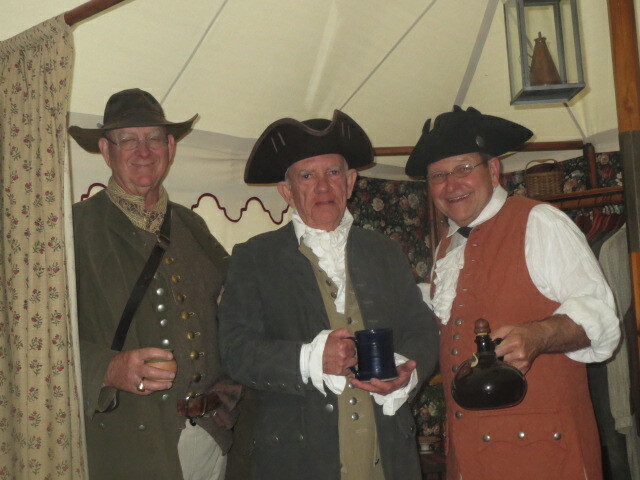 Ed Wilde, Pat Lakin, and Dave Wiederhold enjoying after-dinner spirits by a comfortable warm stove. Fort de Chartres, November 2014. Justin & Janelle Heffner on their wedding day. Fort de Chartres, November 2014. Cleanup after a party often lasts through the next morning. 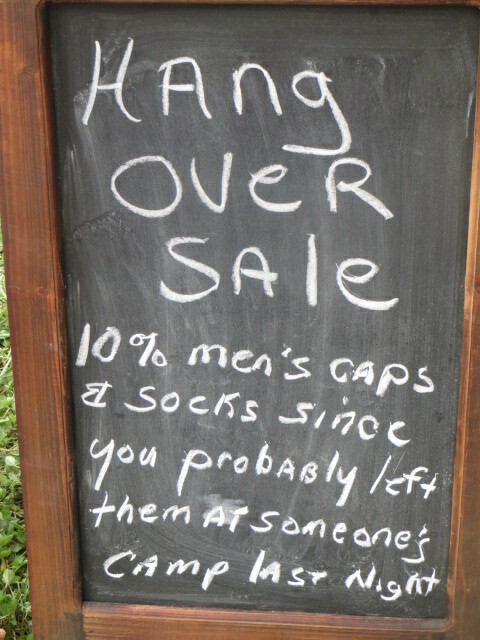 This sign has helped stray clothes find their owners, or is it the other way around? The Beggar - Julian Vermillion. This is always an option for all of us. It'll pay for ice, at least. Take an extra set of clothes for the persona. I can help. Call in advance :) Fort de Chartres, November 2014. 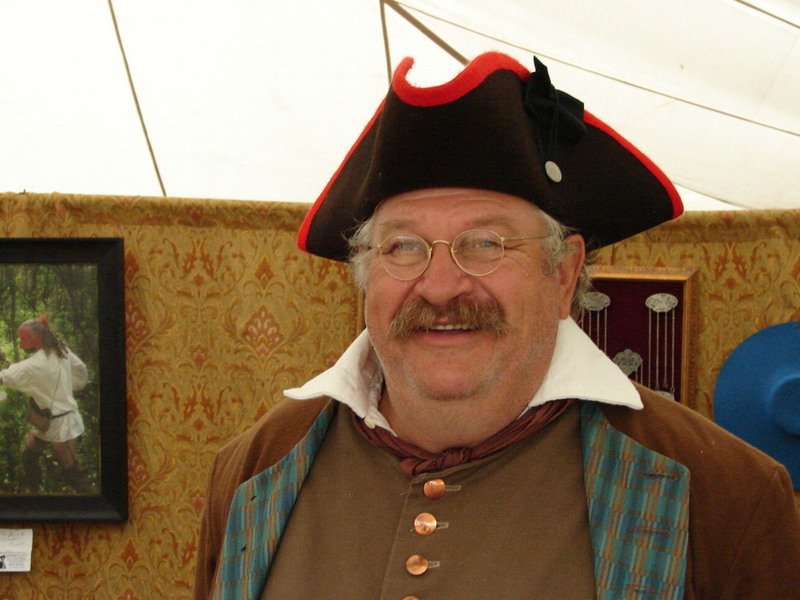 Eldon Dwain Prock, fondly remembered and pictured here in happier times as he helped Cobb Creek at Ft Fred and at Bledsoe's Lick, April and May 2009, respectively. 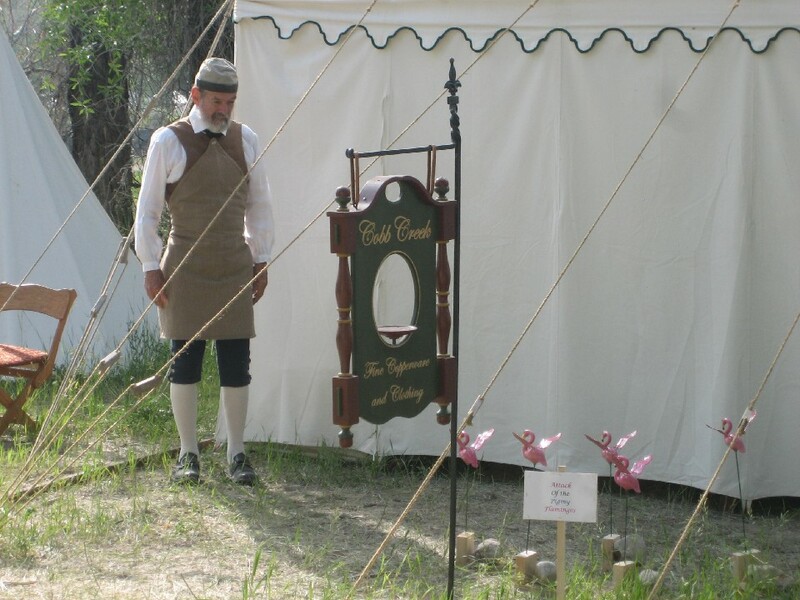 A friend of countless talents and always eager to help, Eldon died February 2015. We miss you, Eldon. His wife Barbara bravely carries on. John "Mac" McAdams, we miss you dear friend, and think of you often; a friendly and quiet gentleman, well-spoken. 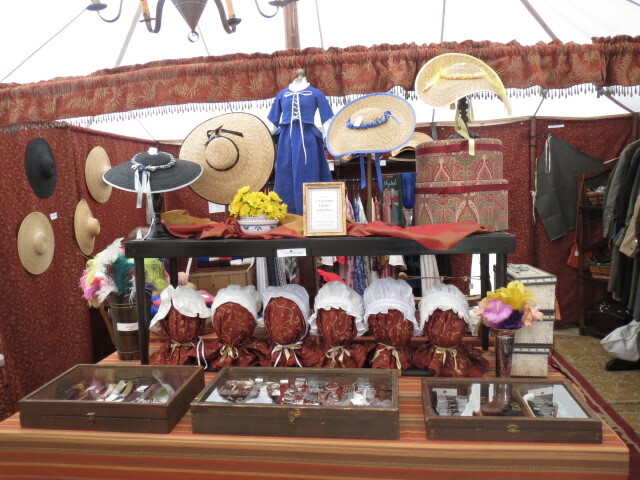 Both exceptionally talented, John and his wife Karen were the proprietors of "Visions of the Past", specializing in accurate and quality moccasins, leggings, and hats of many styles that are a reenactor's treasure to have. John died June 2014. James Hunt is wearing a Cobb Creek weskit and coat. He's quite a fellow. He started coming into the shop as a young teenager. After many visits and browsing a long while, he finally said, "Someday I am going to own one of your coats." He owns at least two, now. It has been a pleasure watching him grow into a wonderful young man. Hi, James! Seth Graves of Eddyville, Illinois. 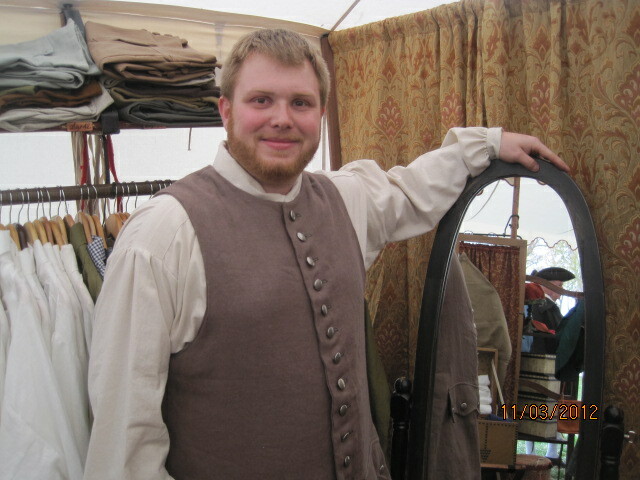 Seth's wife Krysta ordered him a Cobb Creek coat in canvas for Christmas in 2013. 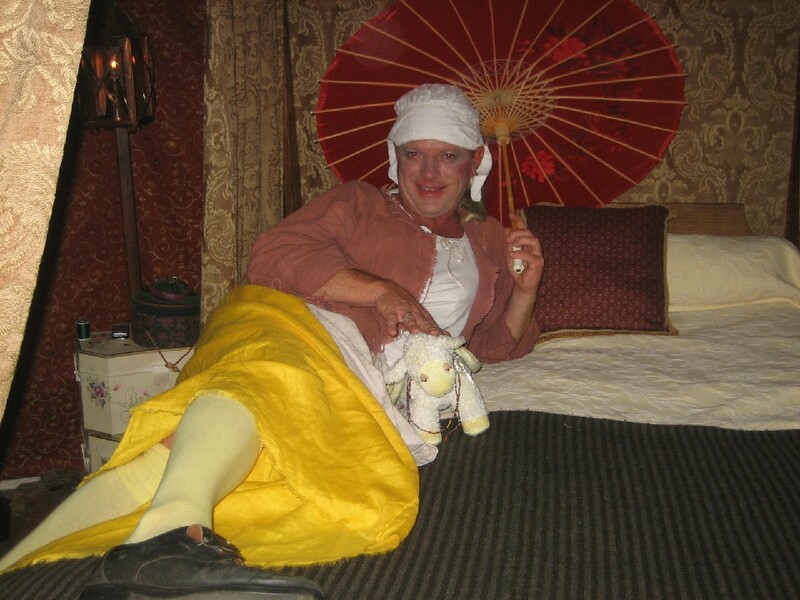 He loved it so much that he ordered another in linen which is what he's wearing in this picture. 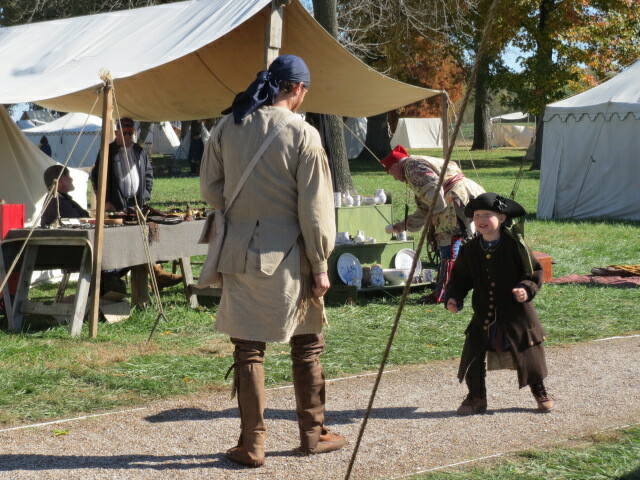 Reenactors come in all sizes and ages. Ft de Chartres, November 2013. 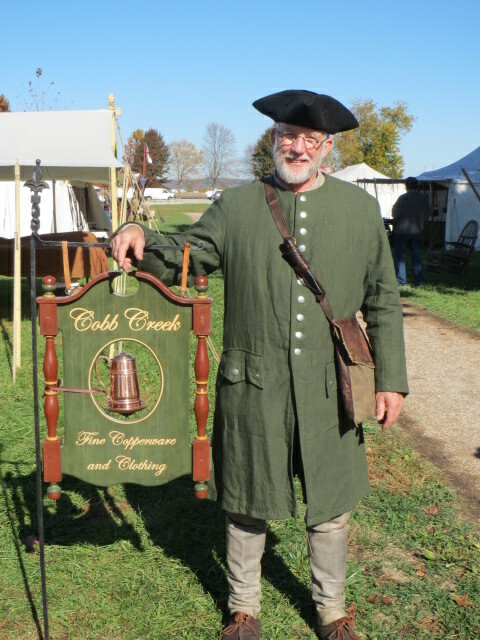 Another happy customer modeling his new clothing, Fort de Chartres, November 2013. I knew his name but forgot. There's so much to remember, especially when new faces arrive. Please drop me a line if you can help. Thanks! 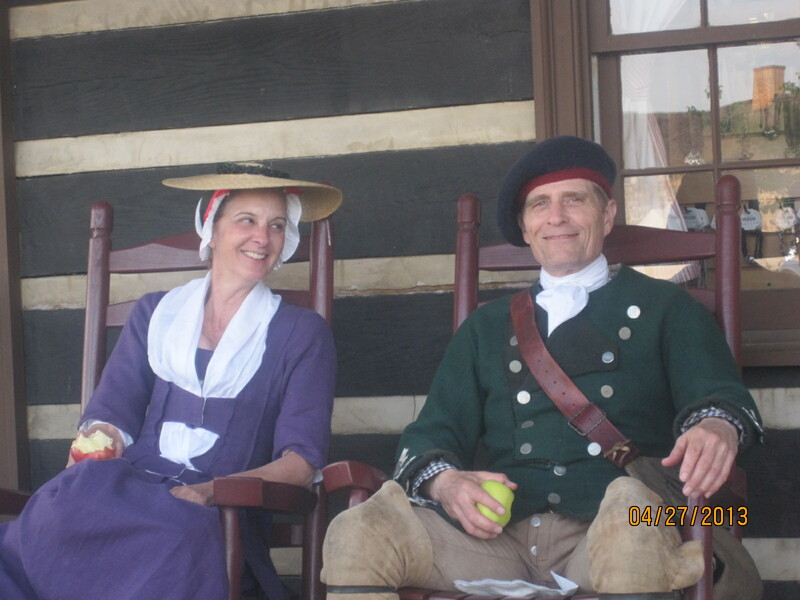 Dave Fagerberg and lovely lady resting on the front porch of the Trading Post at Ft Frederick, April 2013. If you know the lady's name, please drop me a line so I can add it. Thanks in advance! 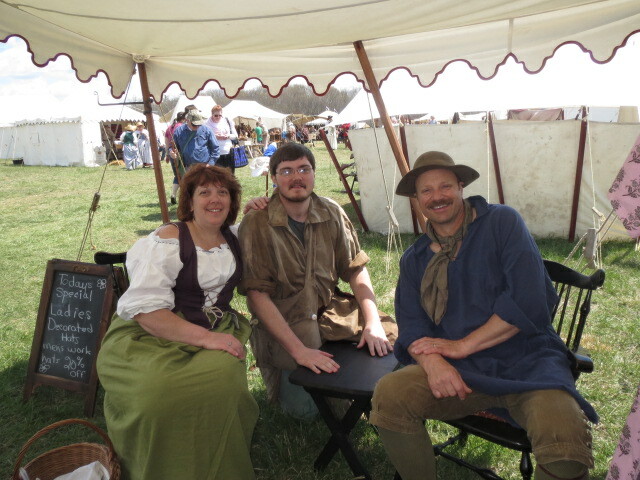 Bill McKelvie and John Kreaski traveled all the way from Colorado to visit Ft Frederick, April 2013. They're taking a rest after a lot of man-hours of shopping. 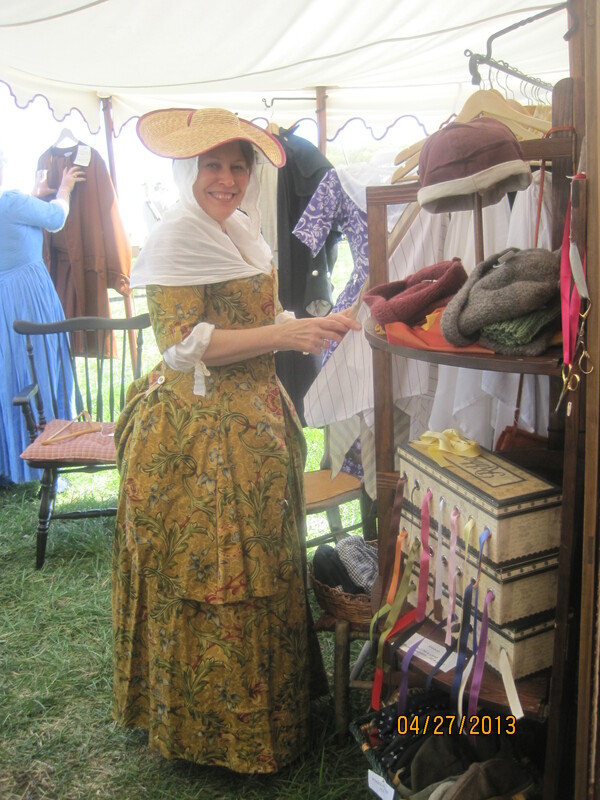 Kathleen McLaughlin (aka Mrs. Lee Offen) shopping in her new outfit she had bought the day before at Cobb Creek. Ft Frederick, April 2013. 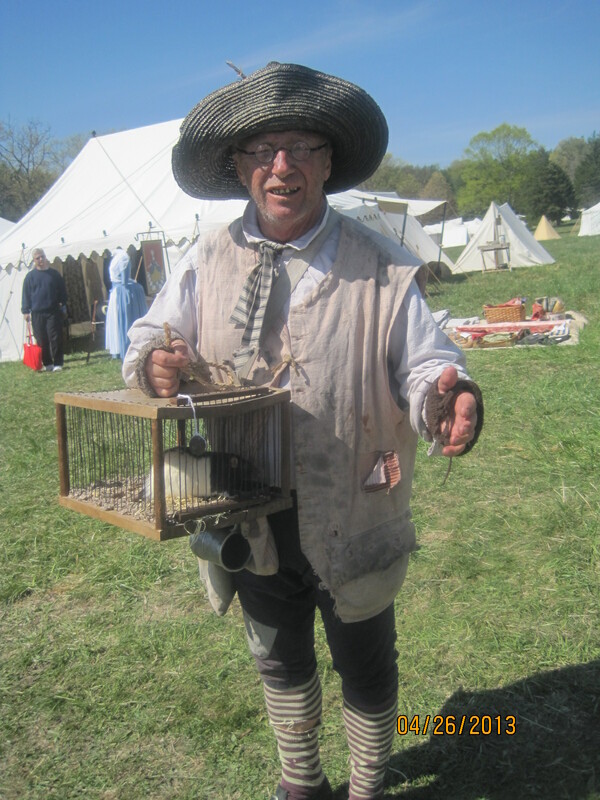 The famous Rat Catcher. He told anyone who would listen that Cobb Creek had rats in its establishment. I shooed him away and his rat, too. Ft Frederick, April 2013. 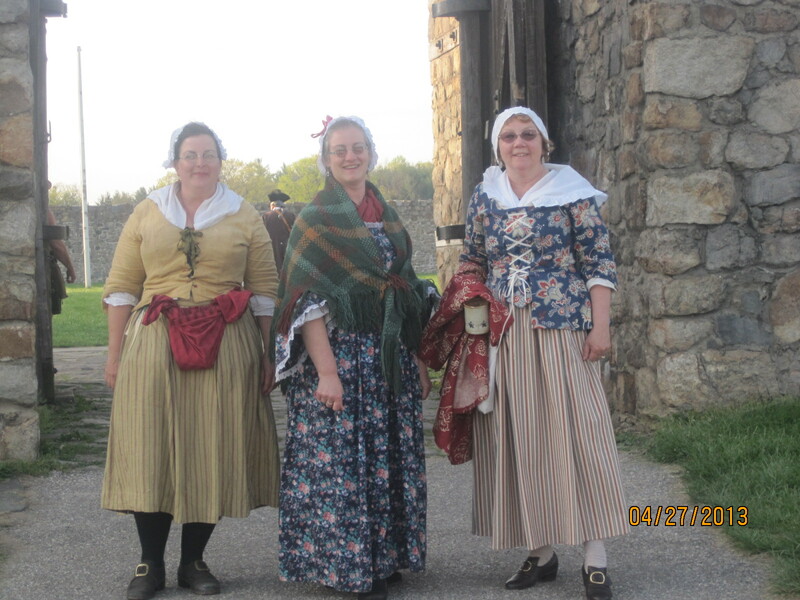 Leanne Bechdel, Claire Moore and Christine McKelvie heading inside Ft Frederick fort walls for a Saturday night of festivities. April 2013. 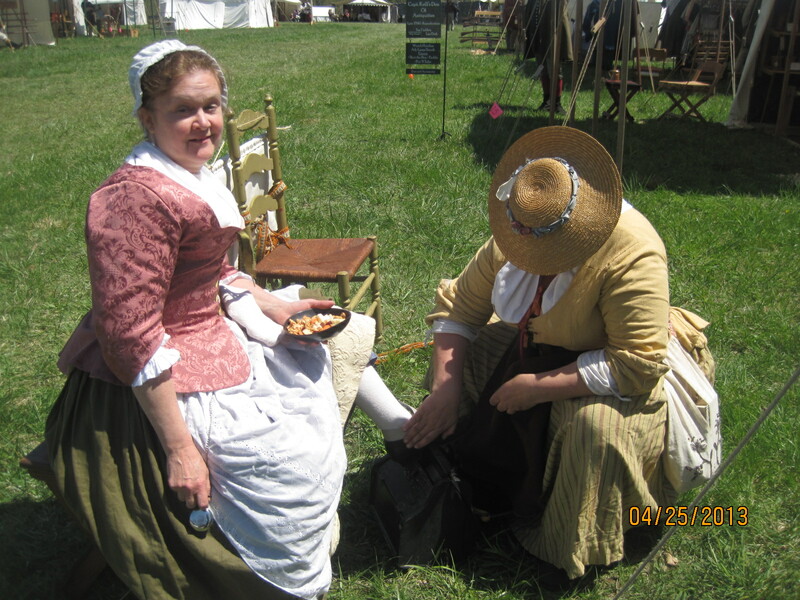 Leanne Bechdel giving foot and leg relief to Janice Smith after a long day of work at Ft Frederick, April 2013. It is a wonderful treat, believe me. 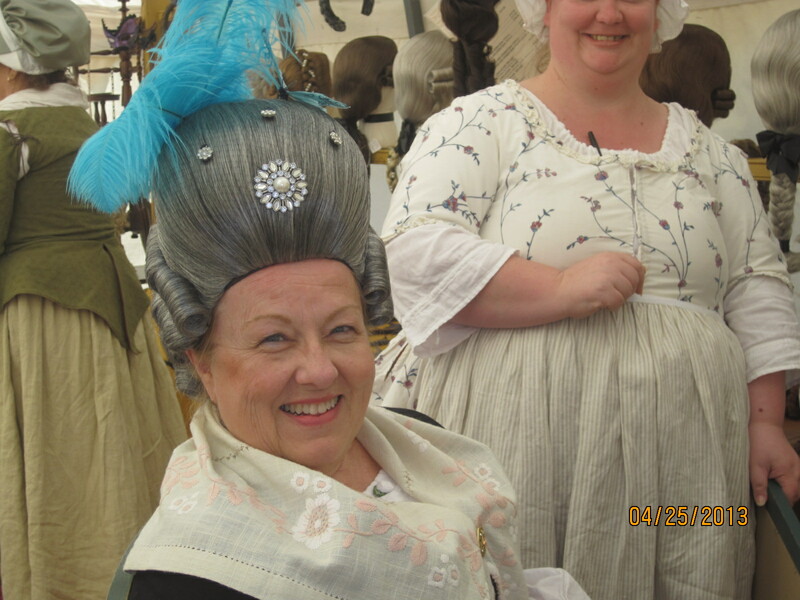 Karen Burkett from Ohio trying a wig at the "Wig Shop". Ft Frederick, April 2013. Tea time with Dave and Karen Krill, Steve Leinweber, John Kraeski, Vicky Harding, Dave Fagerberg and lady friend. Ft Frederick, April 2013. 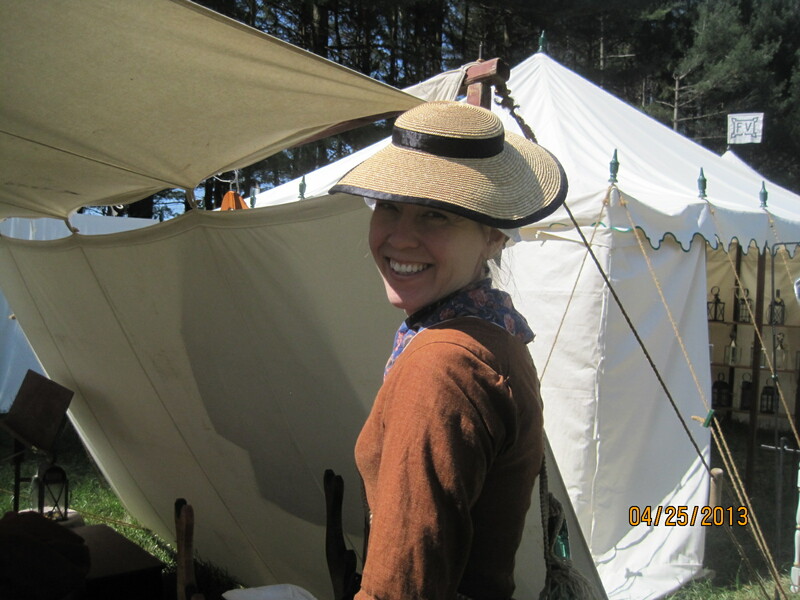 Krista Delp of Virginia -- beautiful wife of Mike Delp of "Delps Stockings". Ft Frederick, April 2013. 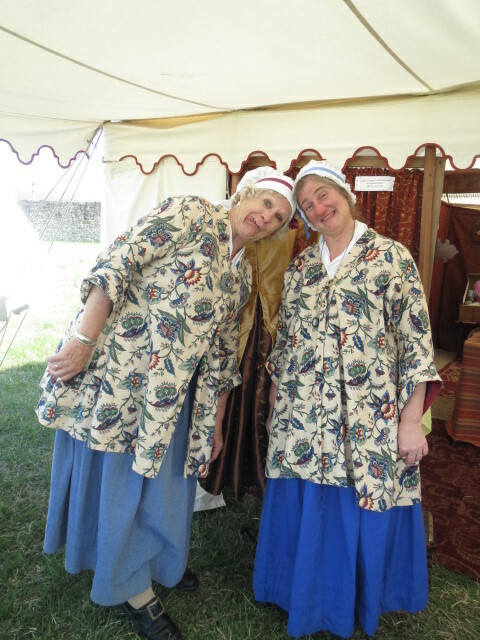 Mel and Beth Kent enjoying their complete new outfits at Ft Frederick, April 2013. 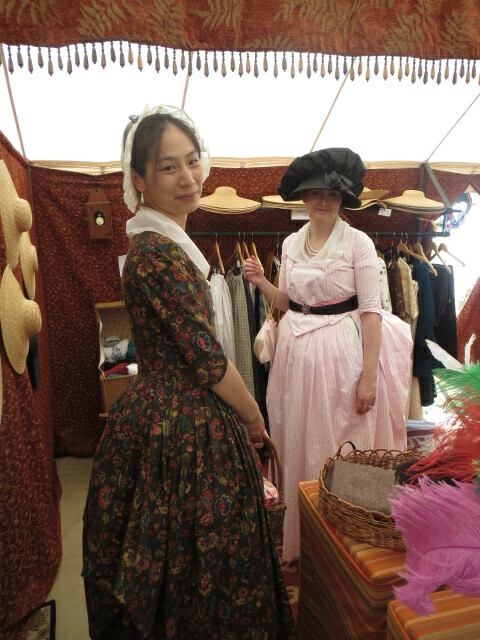 Among Cobb Creek Merchant's distinguished visitors are these very fun folks. 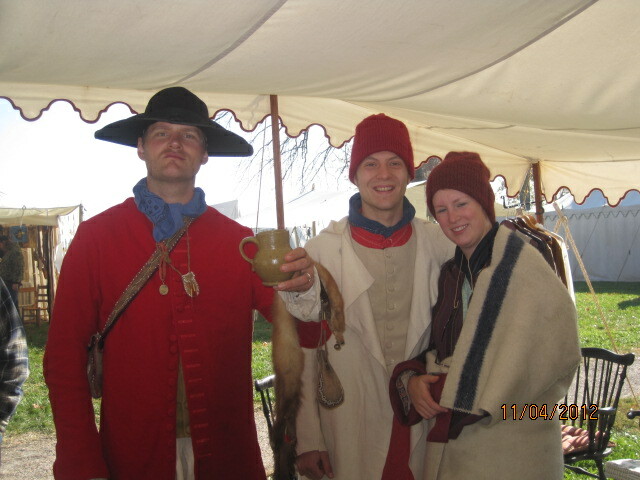 In the red coat is Henry', a Frenchman portrayed by Gene Tesdahl who is also the Staff Historian for the "Journal of the Early Americas" publication. While being a model interpreter, he also... in Kathy's words, "He just cracks me up. I love him." 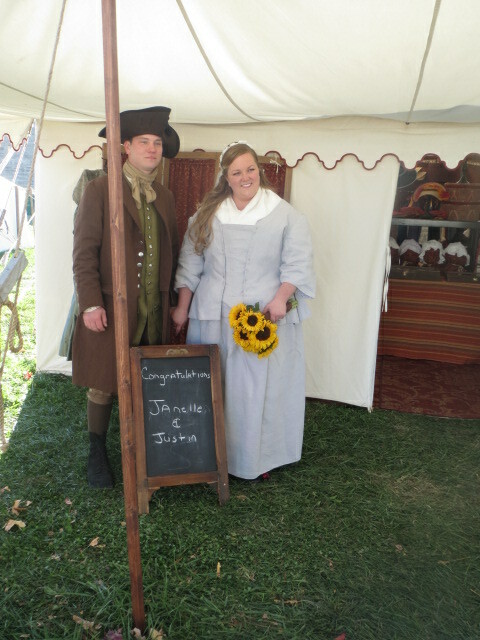 Accompanying him are newly weds; his sister Summer Walter and her husband Andy. 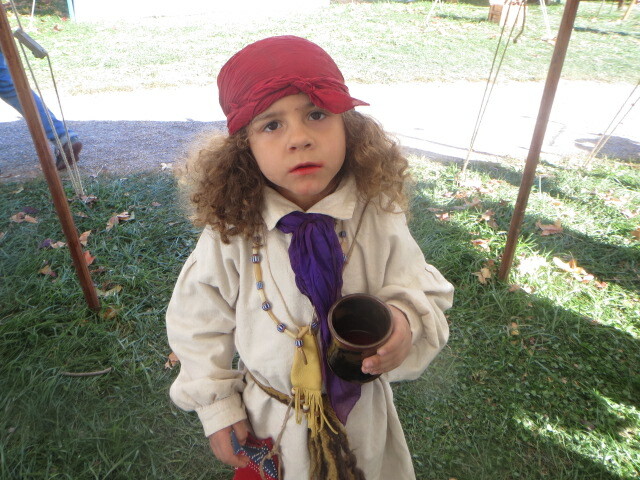 Summer is the Creative Director for the "Journal of the Early Americas". 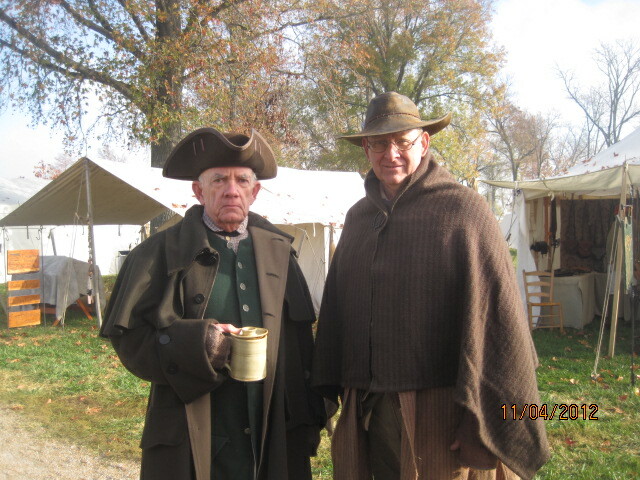 Pat Lakin and Ed Wilde keeping warm. Fort de Chartres, Nov 2012. 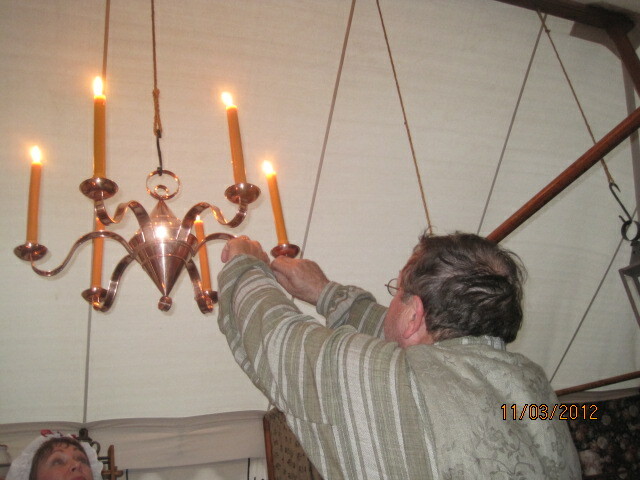 Dave Wiederhold prepares the evening's dinner light; chandelier by Master Coppersmith Larry Ring. Gives awesome light from above - makes the whole marquee glow like a Halloween pumpkin, but easily "dimmable" for atmosphere. 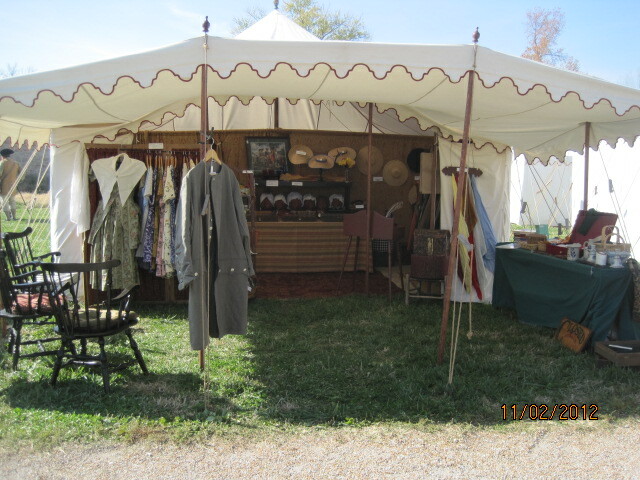 Fort de Chartres, Nov 2012. 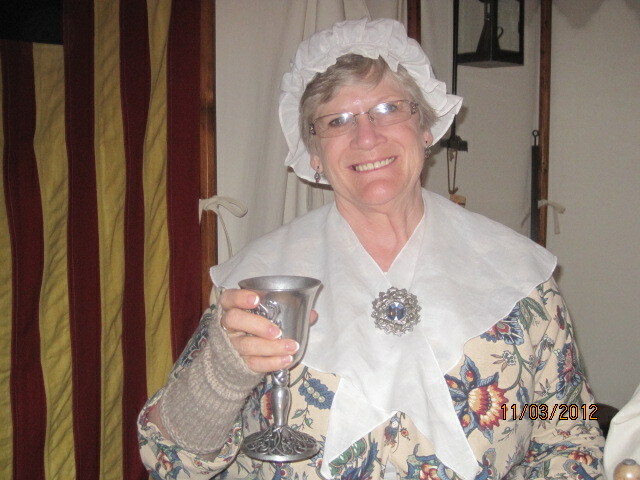 Vickie Harding toasts another successful day for Cobb Creek. Cobb Creek guest Chris Mason from Kent, Washington, always good at knowing where he was needed before anyone had to ask, arriving with the energy of two and a big grin. He was a blessing from set-up through tear-down and lots of fun. Fort de Chartres, Nov 2012. 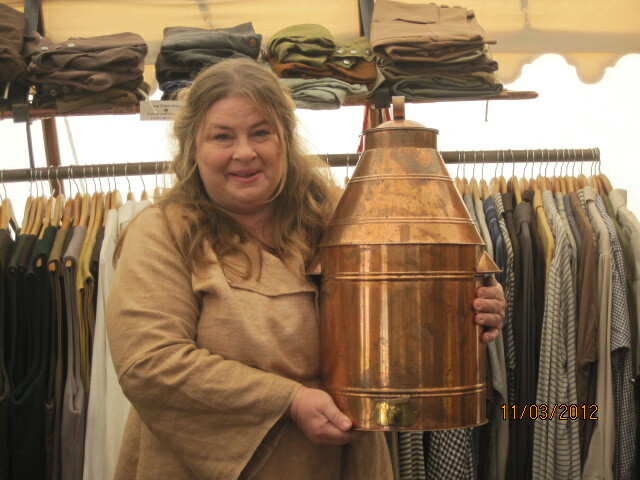 Lisa Crews thrilled with her lucky find on a trade blanket; a beautiful 6-gallon cistern made by the late Master Coppersmith Larry Ring, at Fort de Chartres, Nov 2012. 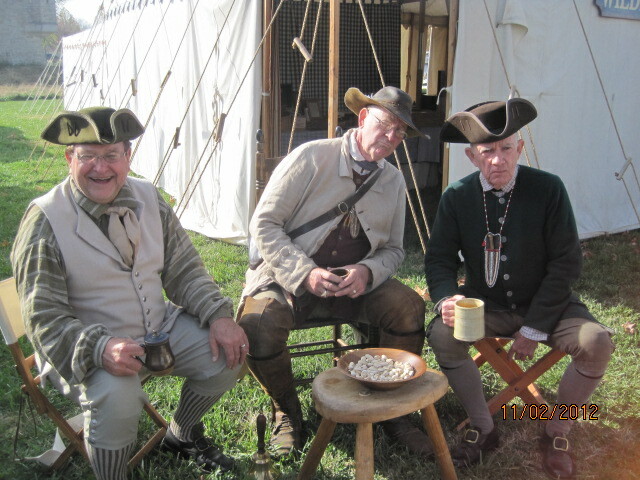 Traditional Tea Time in front of Wilde Weavery's entertaining tourists over a bowl of popcorn at Fort de Chartres, Nov 2012. The three amigos left to right: Dave Wiederhold, Ed Wilde, and always dapper Pat Lakin. Cobb Creek Merchants open for business. Fort de Chartres, Nov 2012. Ed Wilde mixing up his batch of hot buttered rum for a yearly contest - sadly he did not win, but it was still very good … yum rum. 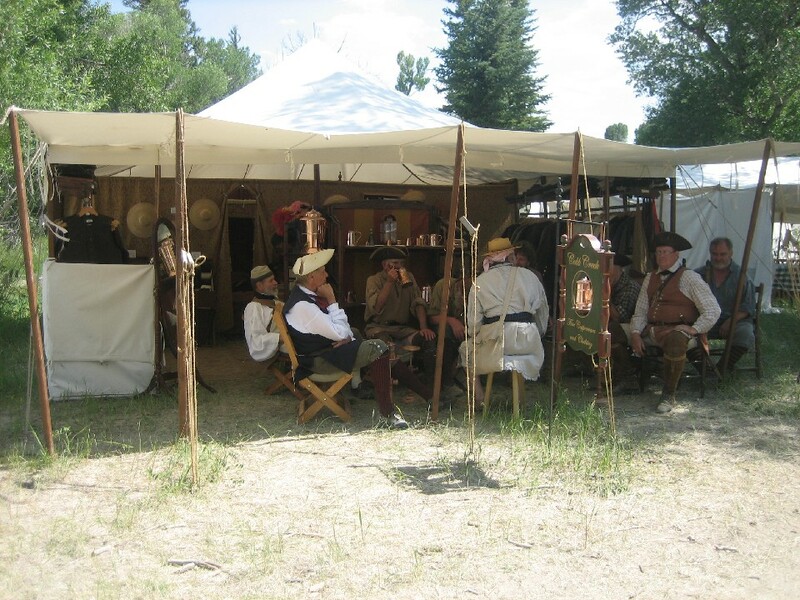 Rocky Mountain National Rendezvous on the Green River in Wyoming, 2008. The boys having afternoon tea everyday at 3 pm come rain or shine. Dave Krill, Larry Ring, Pat Lakin, Neill Fields, David Baird, Rufus Ayala, Ed Wilde and Dennis Duffy. Rocky Mountain National Rendezvous on the Green River in Wyoming, 2008. The Longhunters---Mike Thornton, David Baird, Rufus Ayala, Pat Lakin, and Kyne Clark. 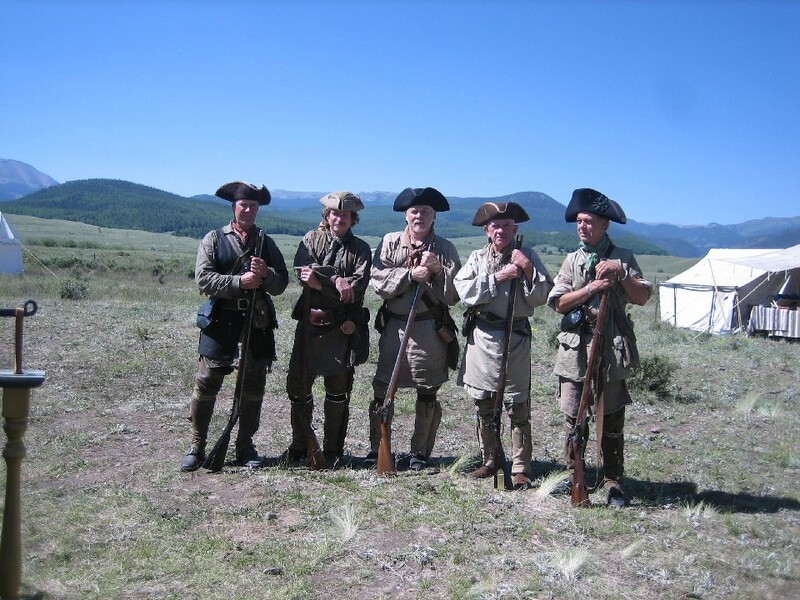 Rocky Mountain National Rendezvous – Creede, Colorado, 2006. Master Ring trying to figure out where the pink flamingos came from. 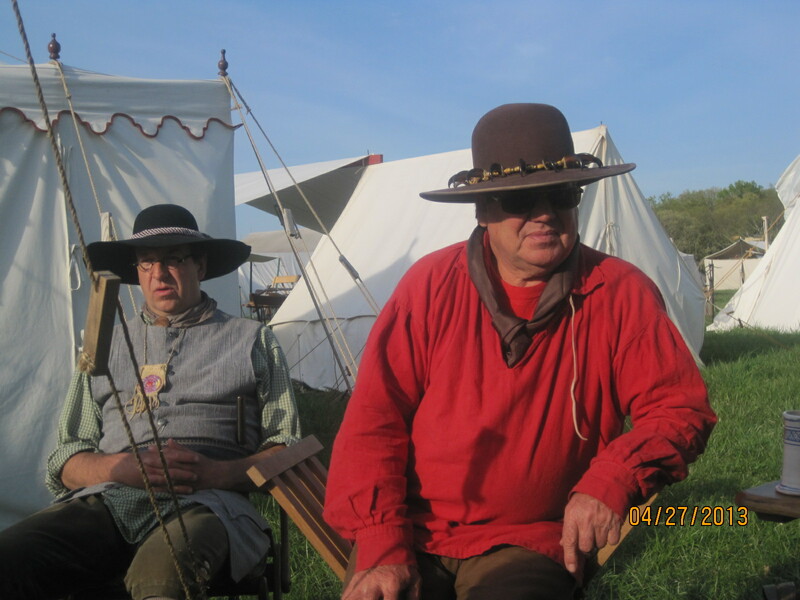 Rocky Mountain National Rendezvous on the Green River in Wyoming, 2008. 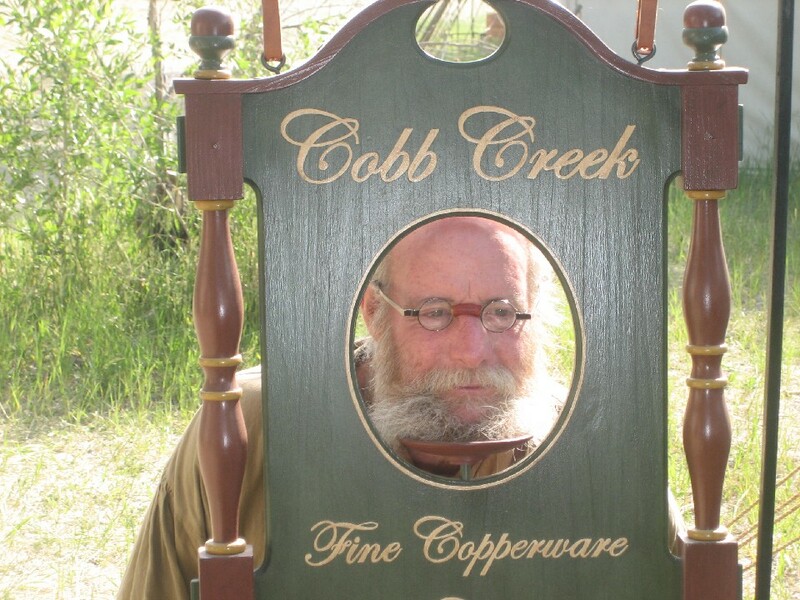 Another use for our Cobb Creek Sign -- we charge to have your picture taken in it. Neill Fields was our first customer. 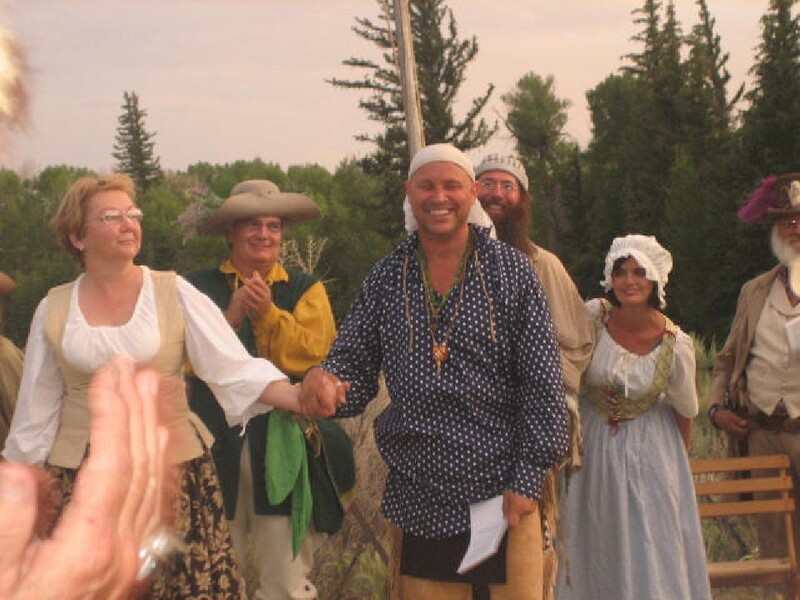 Rocky Mountain National Rendezvous on the Green River in Wyoming, 2008. Home away from home. 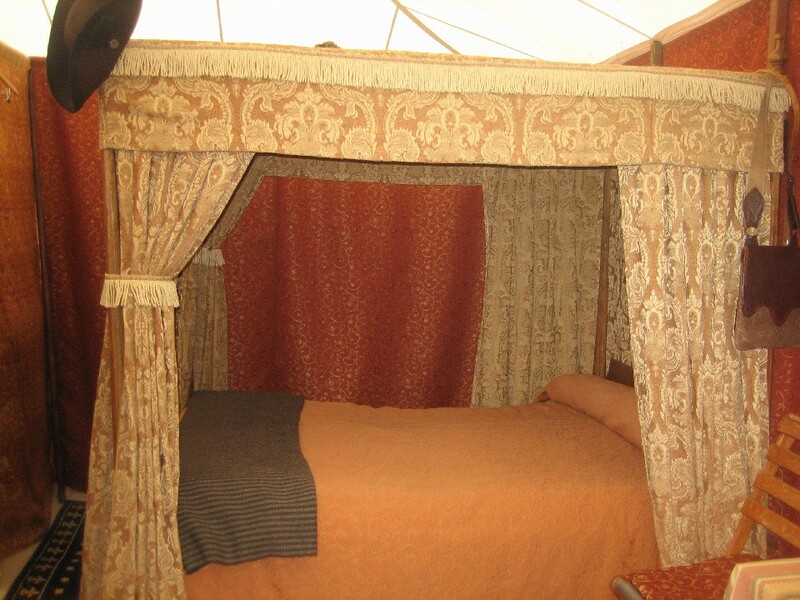 A bed fit for a princess - me. On top of a mountain in Cumberland Gap, Virginia, during a break between two events. Great time with great friends. 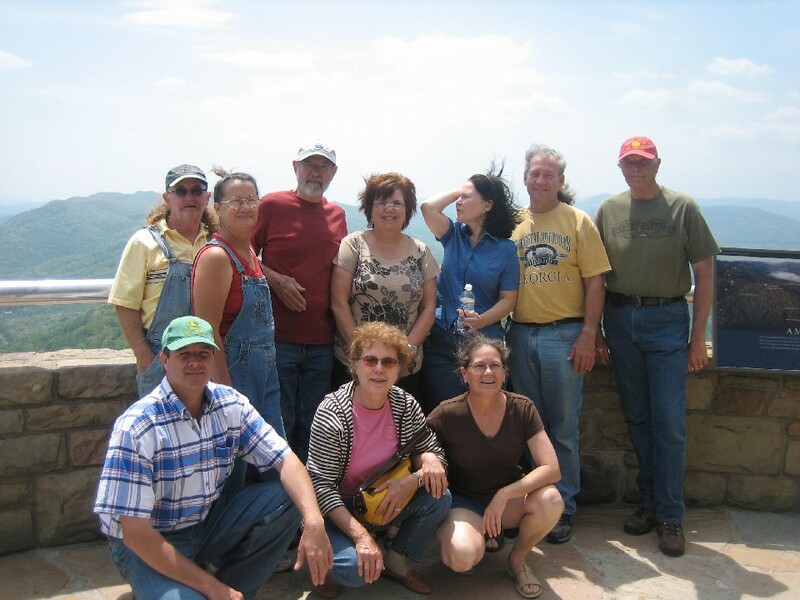 Leroy, Frannie and Shawn Sanders of Fort Downing Traders, Larry and Kathy Ring of Cobb Creek Traders, Peggy and Dennis Earp of 96 District Storehouse, Dave and Karen Krill of Captain Krill’s Den of Antiquity and Shelly Bender of The Irish Maid. Larry Ring with one of his many other women-Cherie Gichner--What can a lady do but turn her head?. 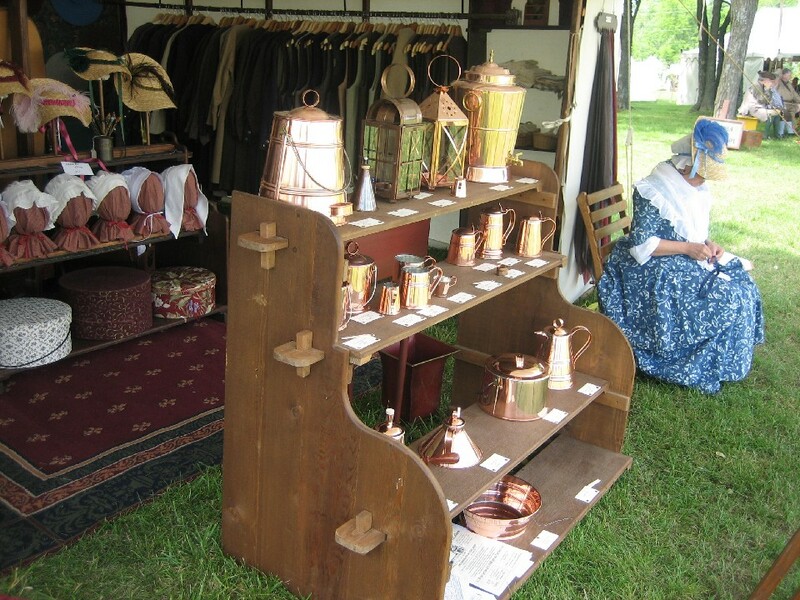 Eastern Primitive Rendezvous, Muddy Run State Park, Pennsylvania, 2007. 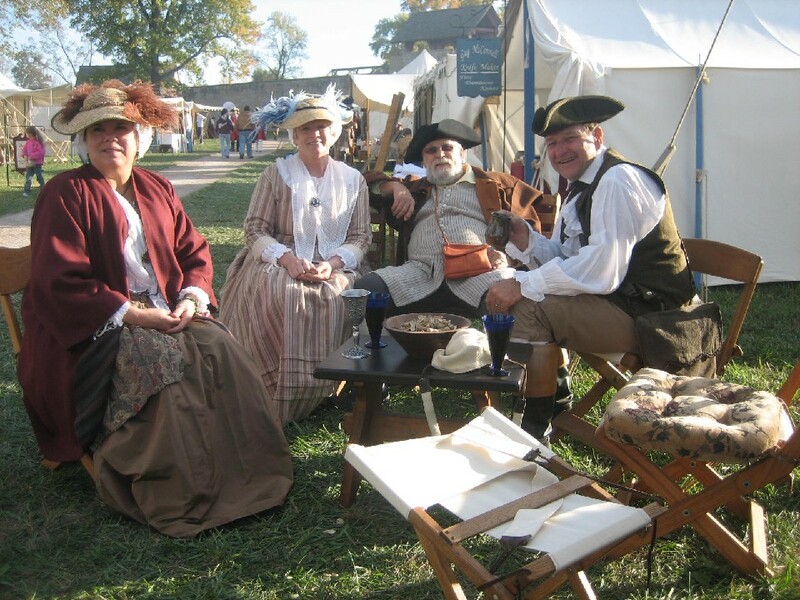 Enjoying “Tea Time” – a favorite time of the day to sit, chat, entertain, and be mischievous, too! Kathy Ring, Vicky and Lou Harding, and Dave Wiederhold. Fort de Chartres, November 2007. 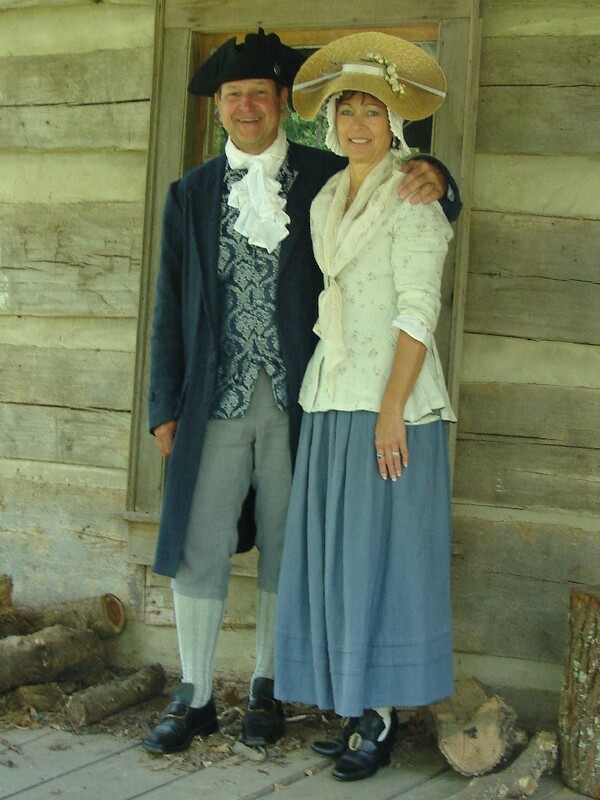 Dave & Debbie Wiederhold on a stroll exploring the ground spring, woods, and old cabins of Bledsoe’s Fort Colonial Fair, May 2008. Larry Ring’s copper bench full of treasures to be had. Mansker’s Station, May 2007. Visiting California Girls, Gabi and Alyssa, resting from a day of rain and dainty mud stomping. 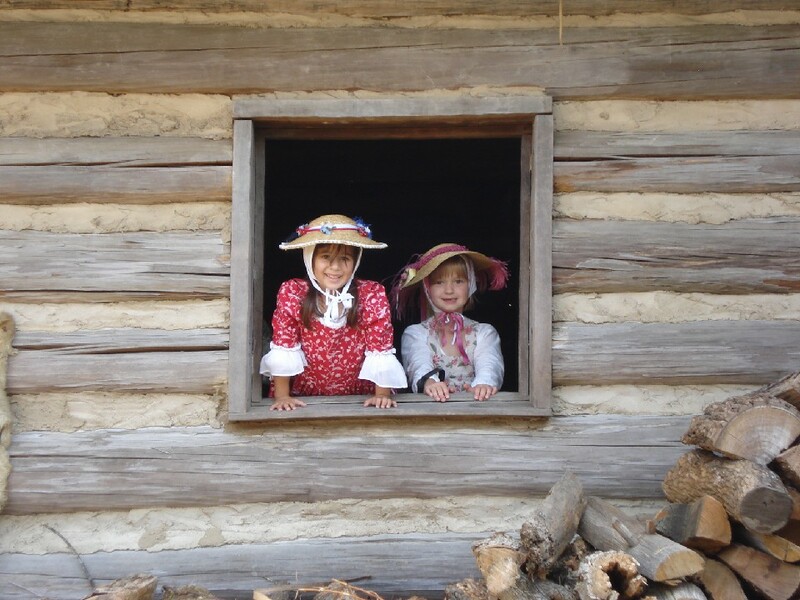 Both granddaughters - Gabi is Teresa Hansen’s and Alyssa is Debbie Wiederhold’s. Mansker’s Station, May 2007. Enjoying a lazy afternoon watching the tourists are Teresa Hansen and her sister Debbie Wiederhold. Mansker’s Station, May 2007. 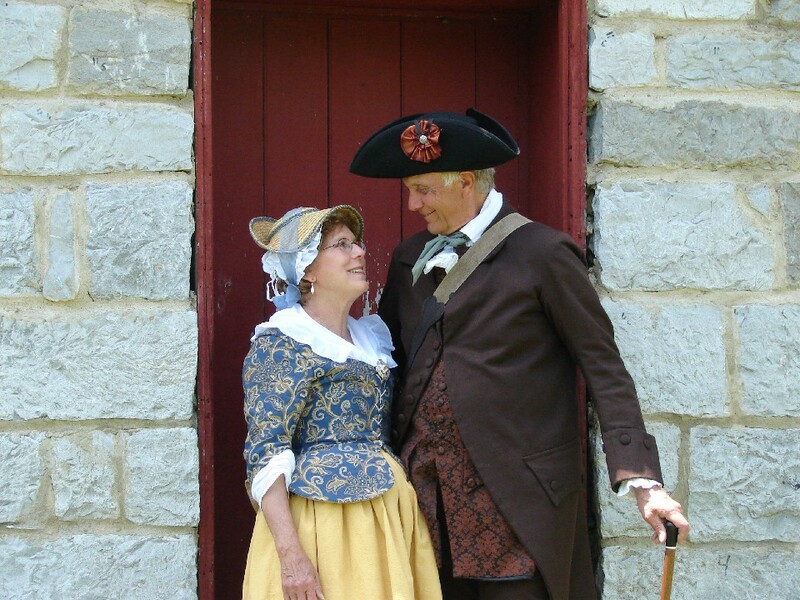 One picture from a funny sequence full of laughs and smirks, here’s Karen and Dave Krill at picture time at Bledsoe’s Fort Colonial Fair, May 2008. 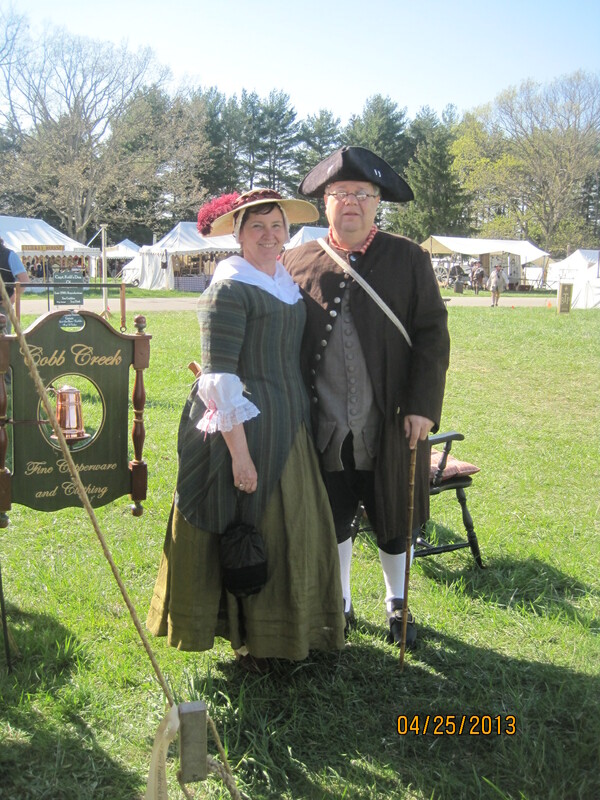 The official Daniel Boone of Kentucky (Steve Caudill) posing as his counterpart, Sally, at the Eastern Primitive Rendezvous, Muddy Run State Park, Pennsylvania, 2007. 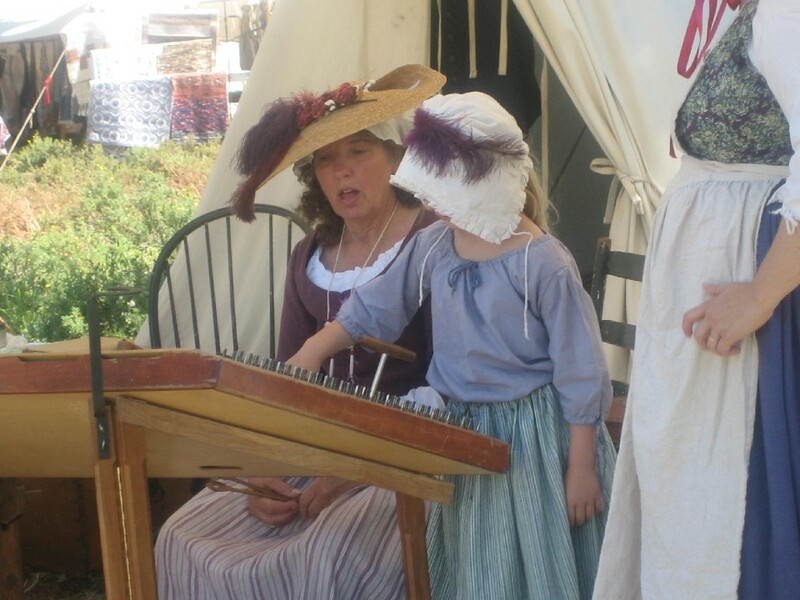 Barbara Duffy giving a young lass a hammered dulcimer lesson. 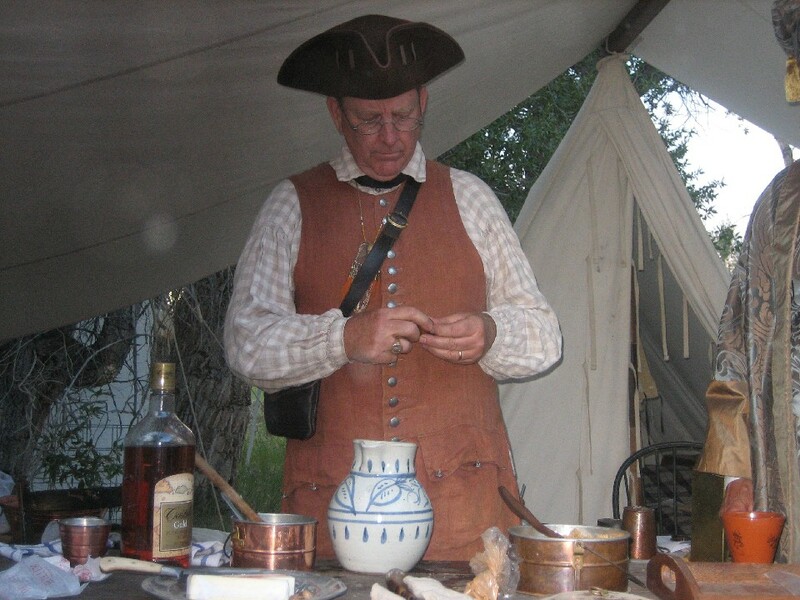 Rocky Mountain National Rendezvous – Creede, Colorado, 2006. 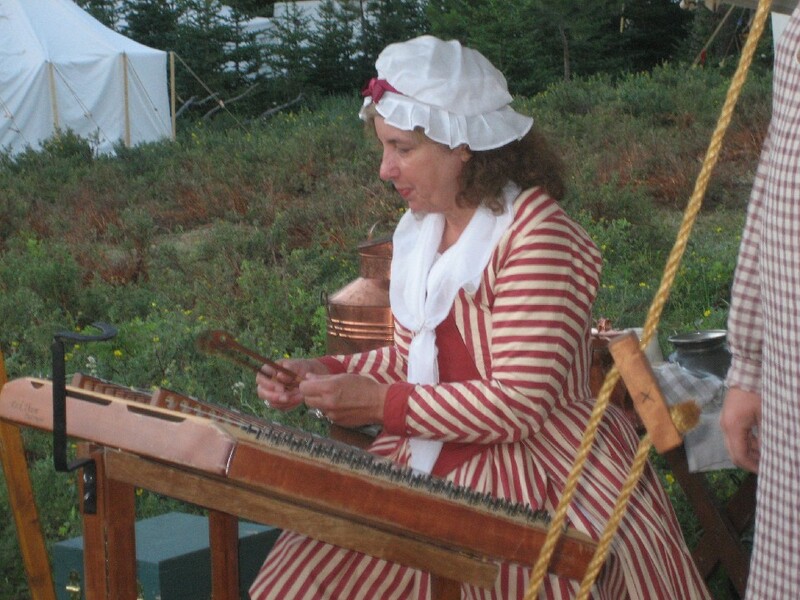 Barbara Duffy entertaining with her beautiful music on the hammered dulcimer-- Rocky Mountain National Rendezvous – Creede, Colorado, 2006. An evening of Farkle. Laura McKelvey, Ken Jansen, Bill Mc Kelvey, Christine McKelvey, Kathy Ring, and a young man visitor. 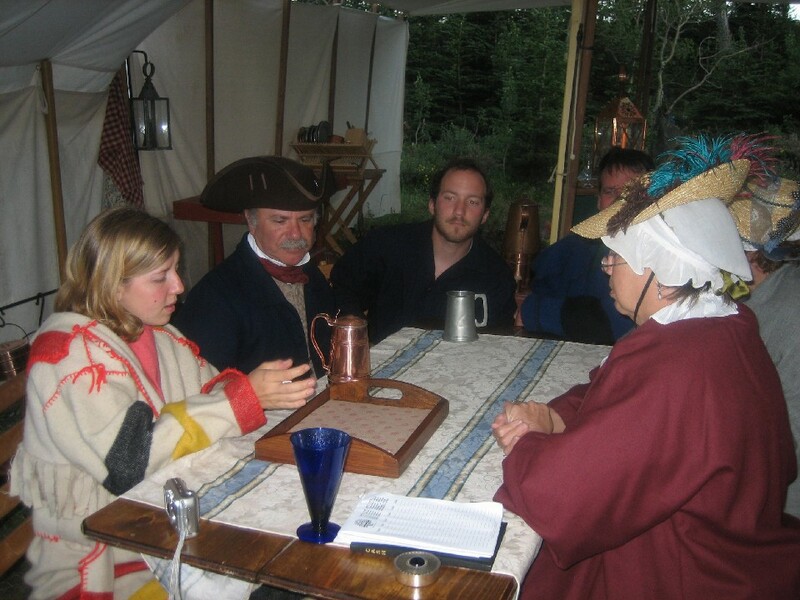 Rocky Mountain National Rendezvous – Creede, Colorado, 2006. 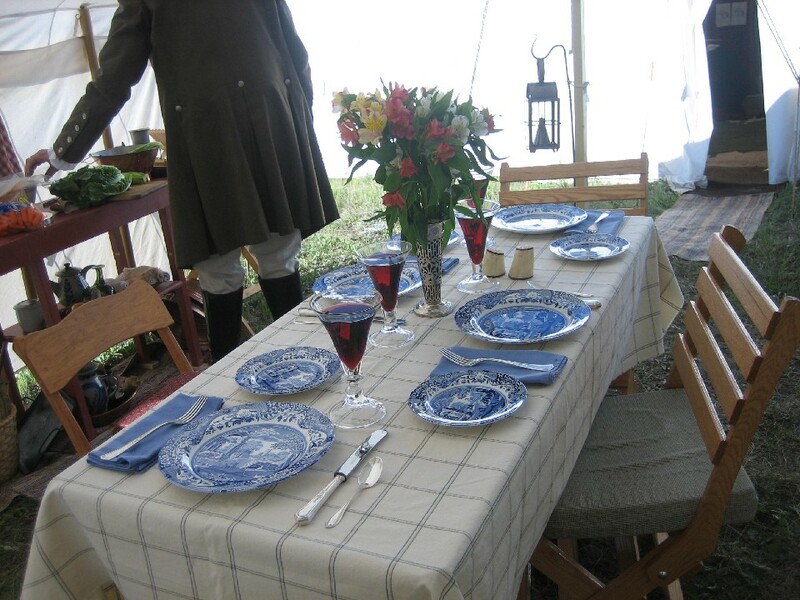 Dining with elegance in the wilderness. Yes, it can be done! Captain and Karen Krill’s camp. 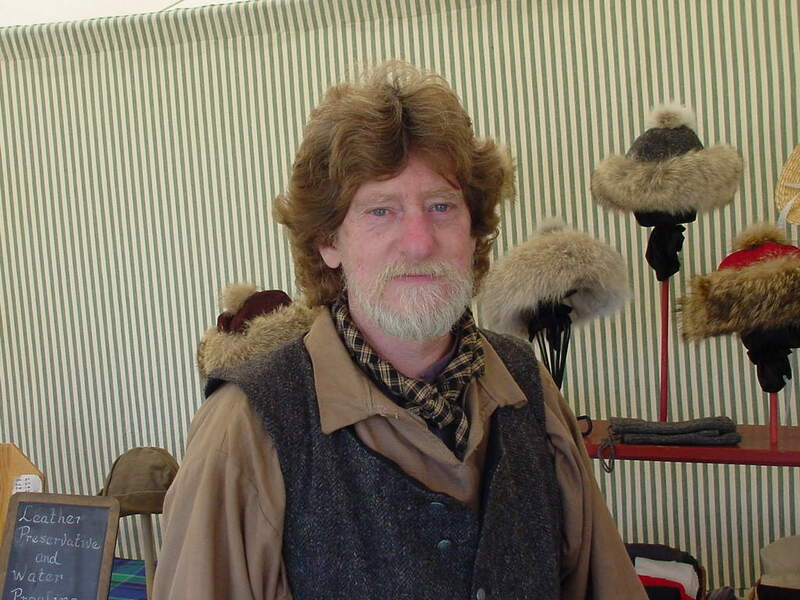 Rocky Mountain National Rendezvous – Creede, Colorado, 2006. 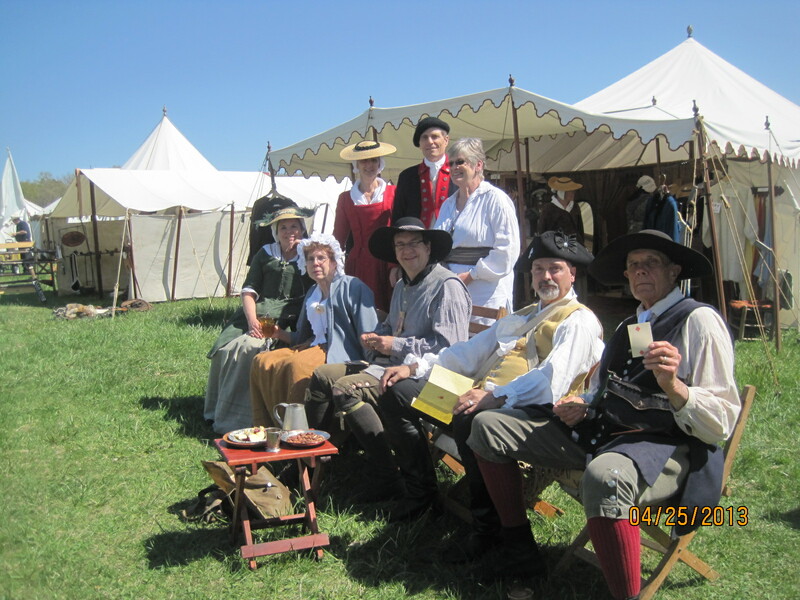 Ladies having afternoon tea and guarding themselves and the tea with a blackpowder gun. 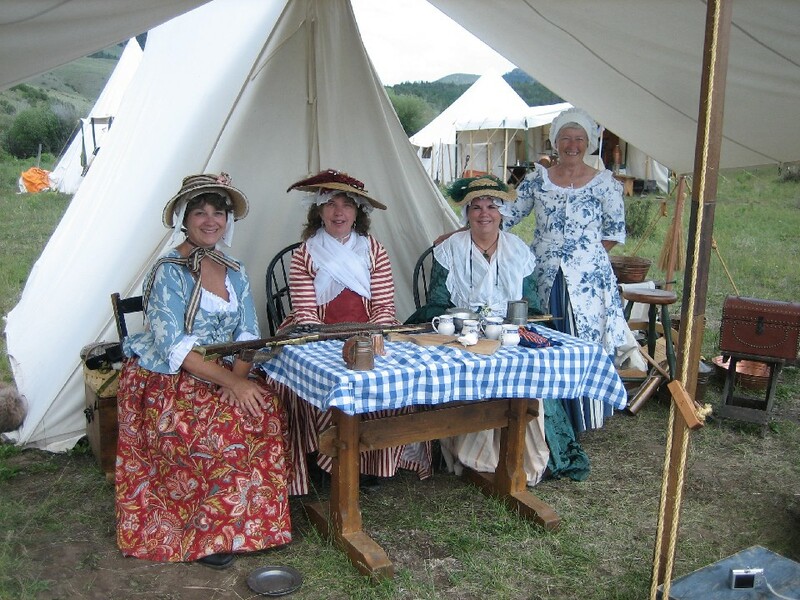 Gail O'Dell, Barb Duffy, Kathy Ring and Ruth Allen at the Rocky Mountain National Rendezvous – Creede, Colorado, 2006.
Who says we can't have culture in the west! 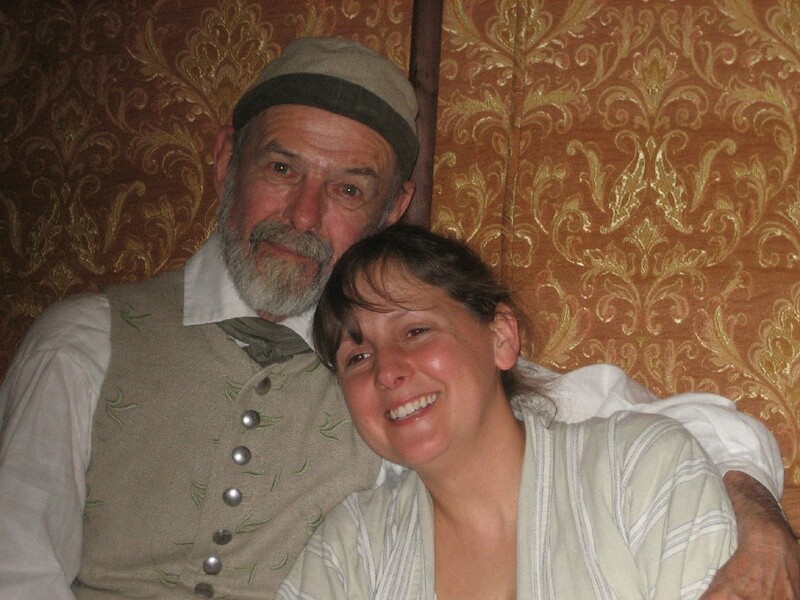 A wonderful cast here putting on Taming of the shrew at Rocky Mountain Nationals in 2008. Lead actress Christine McKelvey.